Manufacturer’s RRP €656.82 – so buy here for BIG savings! The inside of the Sanipack is comprised of a pressure chamber, which starts and stops the unit, and the motor, which drives the stainless steel macerator blades and the pump. When the flush is activated, the water flowing into the Sanipack activates a micro switch in the pressure chamber which in turn starts the motor. The motor is sealed for life in an oil filled enclosure. A common spindle/shaft drives the impeller and the macerator blades. The moving parts therefore are kept to an absolute minimum. Water and organic waste matter enter the chamber and are reduced to slurry as the macerator blades rotate at 3600 RPM. The centrifugal force causes the reduced solids to be ejected through a grill into the container where it is picked up by the impeller pump mounted beneath the motor. 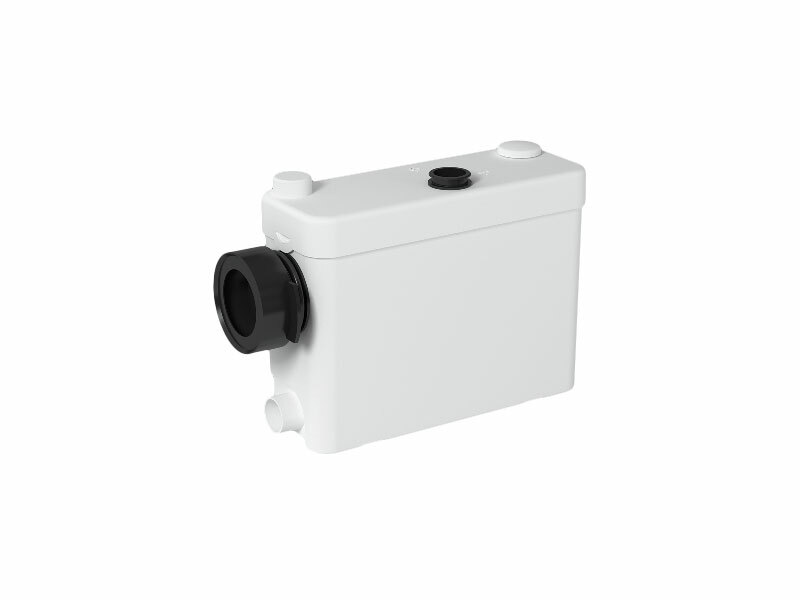 Once the water is discharged and the water level in the container goes down, the micro switch deactivates the unit until the flush is activated again. A normal operating cycle for Sanipack takes about 7-9 seconds depending upon the discharge pipe run configuration; power consumption is therefore minimal. In addition to the toilet waste, the Sanipack will also discharge gray water from a variety of other sanitary fixtures such as: a sink, a shower and a urinal. When adding a shower, a base will have to be constructed. This base should be made out of a 2″ x 6″ (minimum) or 2” x 8” (recommended) on edge, to allow for the installation of a P-trap and the required 1/4”per foot gravity flow towards the pump unit. 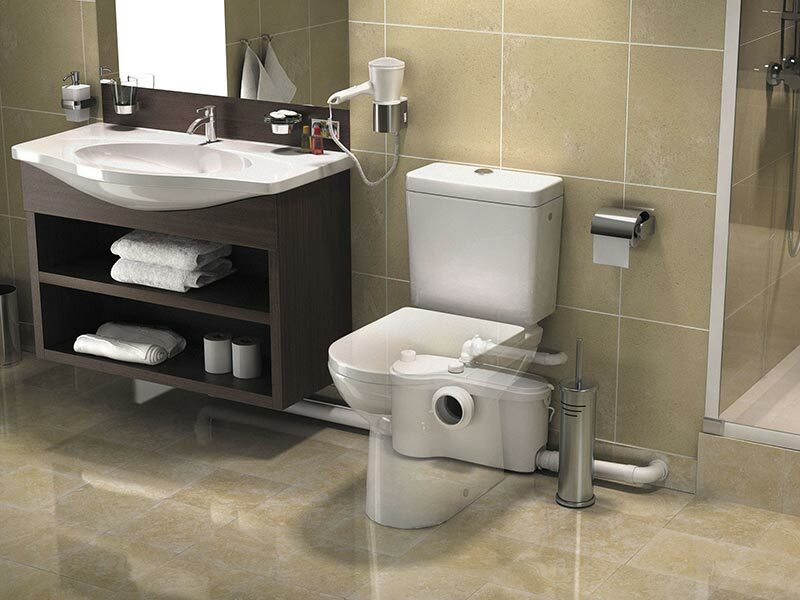 The Sanipack is designed to be used with a wall hung toilet. The depth of the case allows for this pump to be installed within the wall. Since the reservoir, the macerating pump and the pipes are hidden from view. 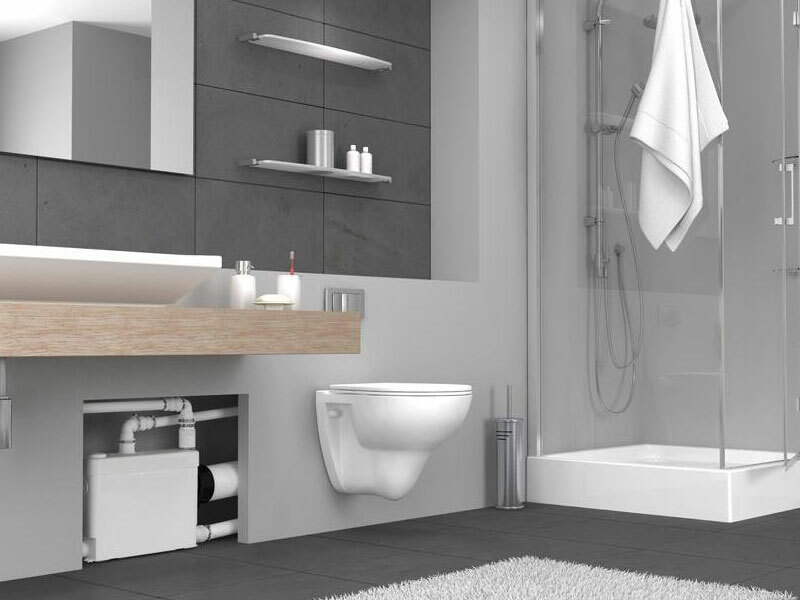 The extra slim Sanipack gives you a stylish way to add a wash-room shower unit or even a complete en-suite shower room or bathroom in a basement or loft extension – or in any home improvement location where conventional large bore pipework would be impractical. The Sanipack along with all of our Saniflo Systems and Kinedo Shower and Bath Solutions can be bought online with the reassurance of dealing with Ireland’s official Saniflo and Kinedo agent.